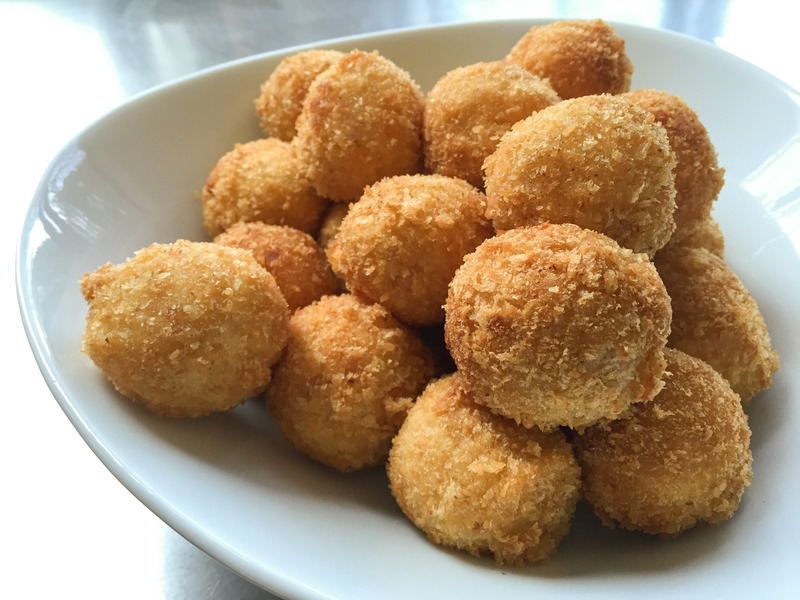 A popular dish often found in tapas bars is croquettes filled with an assortment of fillings. The main ingredient of a croquette is mashed potato. 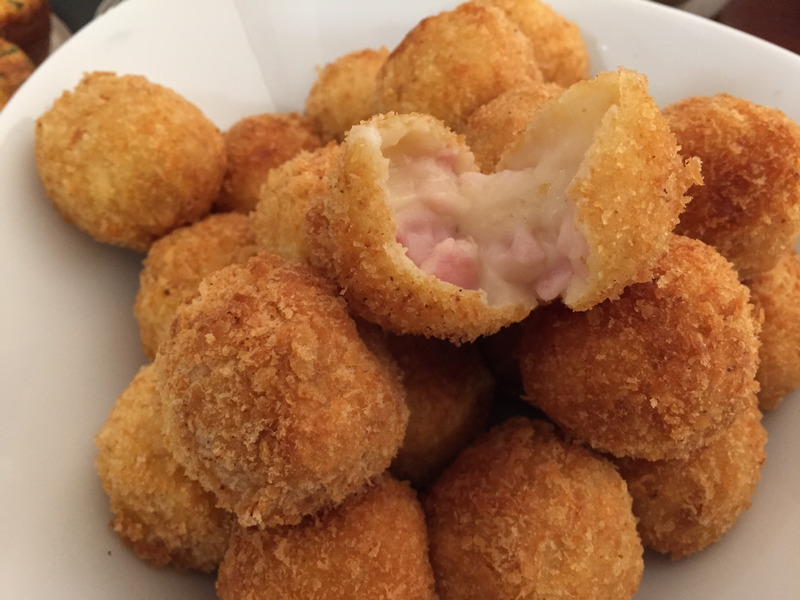 The mashed potato is rolled into a ball or cylinder, then crumbed and deep fried. If there’s anything greater than creamy mashed potato, it is creamy mashed potato that has been crumbed and deep fried. 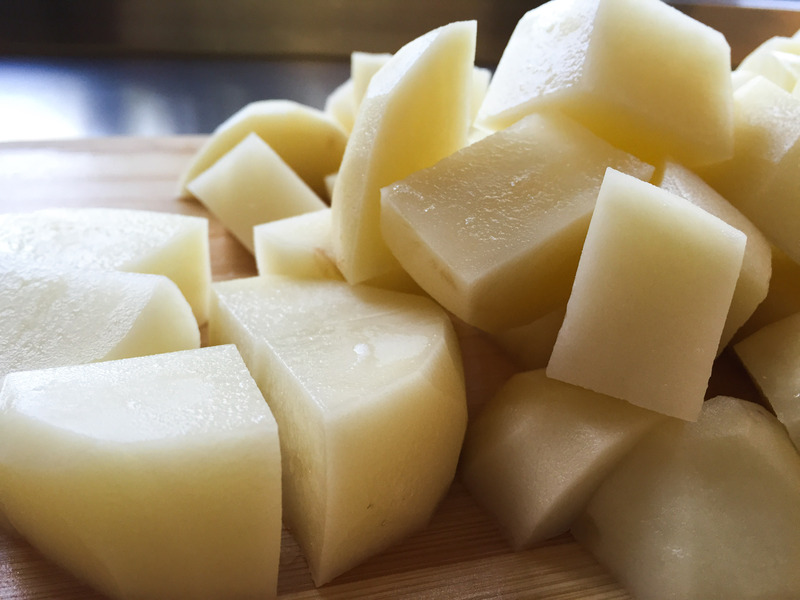 Peel and cube the potatoes into equal size pieces so that they will be ready at the same time. Wash them. Cover them with water until they are just covered and add the 1 tablespoon of salt. When they are cooked, place them into a colander and allow to sit for 4 minutes to allow the water to drain and steam off. Mash the potatoes. I use a mixer with the beater attachment or alternatively you can use a mouli, a masher or a potato ricer. ground salt and pepper to taste. Add the ham and parmagiano reggiano to the mashed potato and mix until well incorporated. Beat the eggs and milk in a separate bowl to make the egg wash mixture. If using a baguette to make the bread crumbs, cut the baguette into small pieces and place into a blender. Process until all the baguette has been turned into crumbs (alternatively use store-bought crumbs). 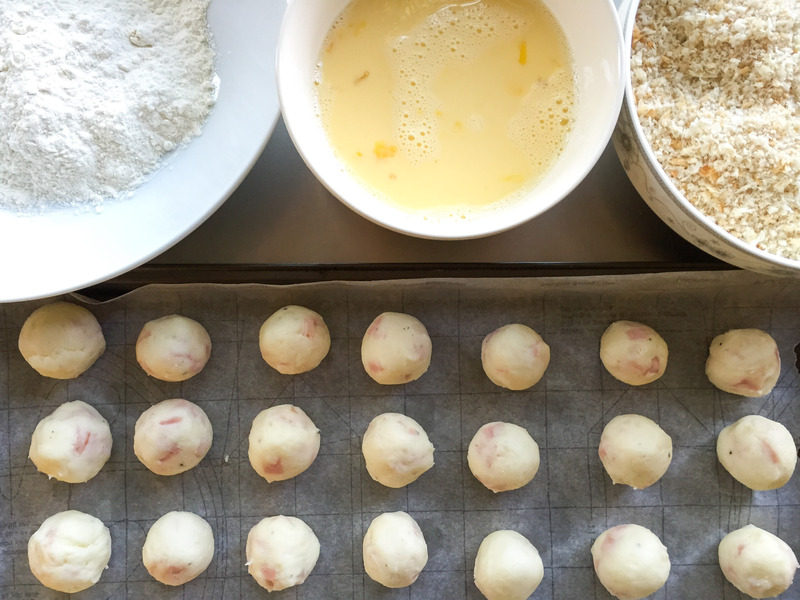 Roll the mashed potato mixture into bite sized balls (approximately 1 tablespoon of mixture for each ball). Once all the mashed potato mixture is rolled into balls, cover each one first with a thin layer of the flour, then coat with the egg wash mixture and finally coat with the bread crumbs. Do this for all of the rolled balls. 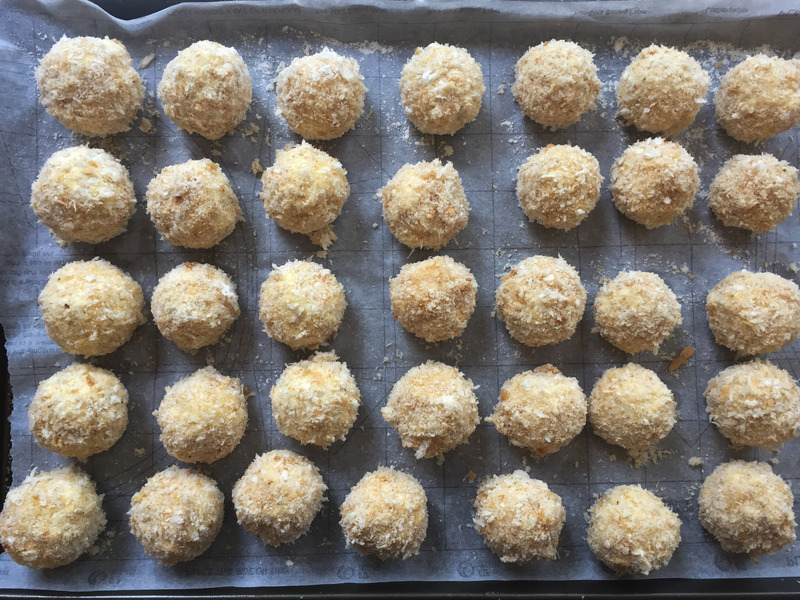 Do a second coating over all the balls following the same procedure as the first coating – cover with a thin layer of flour, coat with egg wash and then finally coat with the bread crumbs. Each ball should have two crumbed layers to prevent any of the potato from leaking out when being deep fried. Pour the vegetable oil into a small pot and heat it to 190 degrees Celsius. Use a candy thermometer to make sure the temperature of the oil doesn’t pass 190. Oil fires can start if the temperature gets too high. Do not leave the pot unattended and never attempt to extinguish an oil fire with water, rather use a fire blanket, non-water fire extinguisher or sand to smother the fire. Once the oil is at 190 degrees Celsius, deep fry the crumbed croquettes 5 at a time. Deep fry until they turn a golden brown colour – approximately 1 minute. Use a slotted spoon to remove the croquettes from the oil. Place the croquettes onto roller towel to drain the excess oil. Keep the fried croquettes in a warm oven to keep them hot while you continue to fry the rest of the croquettes.